Fevers are a symptom. A good symptom. So when my daughter came down with a fever when she was 1 1/2, I wasn't immediately alarmed. Her fever simply indicated that her immune system was working! Studies show that fevers are a defense mechanism. When the body's temperature increases, it creates an inhospitable environment for invading organisms. At the same time, it also increases the number of immune cells to fight virus-infected and/or tumor cells. TV commercials teach parents to help their child by giving aspirin to break the fever. Yet this can do more harm than good! Most of the time, fevers aren't a cause for panic. But does that doesn't mean they shouldn't be treated either. My daughter's fever started out mildly. Gradually, however, her temperature crept toward 102 degrees Fahrenheit. While I cradled her hot head on my shoulder, I browsed online for home remedies that might help. I found one that claimed to bring down a fever fast with egg whites. So I bookmarked the page, and we continued to monitor her. When it got to the point that we didn't want her fever to climb any higher, we pulled a carton of eggs from the refrigerator. Soak a paper towel or cloth in egg whites. Place the soaked cloth on the soles of the fevered person's feet, and put socks on to keep the cloths in place. When the cloths become warm, soak more cloths in egg whites and repeat until the fever is reduced to a safe level. The egg whites immediately drew the fever from the head to the feet. Once her temperature dropped to a safe level, we stopped the treatment so her body could continue to fight the illness naturally. We repeated the egg whites only if her temperature spiked again. By the next day, she had no fever and was acting normally! While safe fevers are good, it's also important to remember that they can dehydrate a person. This alone is often more concerning than the fever itself. So, keep hydrated in a way that allows the body to work at optimal levels! In other words, with non-sugary liquids. Or, make my favorite go-to tincture: Pepper Juice! All 5 fresh ingredients are diaphoretic. It's the reason our family hasn't gone to the doctor for colds or flus in over 4 years. How do you feel about fevers? What do you do instead or when a fever gets too high? 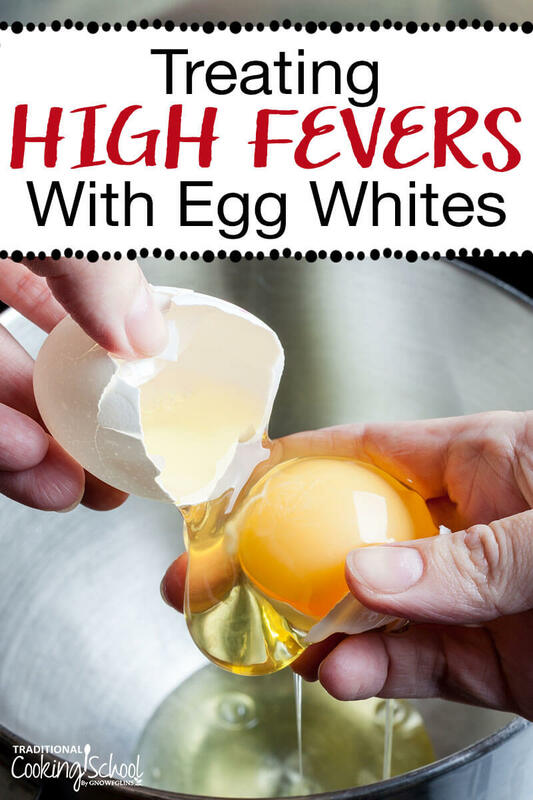 Did you know about treating high fevers with egg whites? I wouldn’t give comfrey tea to anybody under 4 or so. That’s asking a lot of a undeveloped liver. But yes, there are lots of ways to bring down a fever without traditional (or perhaps we should say non-traditional) meds. I like the rest of it! The other week our two in a half year old son came down with a 103.4 fever. I put some clay in a bath tub, put in luke warm water, put in our sick son along with our oldest (he’s four), and they played for an hour. Before you knew it the water turned cold but they still didnt want to get out lol The water quickly cooled my son down and he had his fever for less than 24 hrs. Besides the bath we just gave him cod liver oil, some diluted fire cider and some broth. No one else in the house got sick or anything. No idea what that was about but I was very happy it went away fast! Great article, however, I think people should know that comfry is a bit controversial as a tea. The newest leaves in particular have the highest alkaloid content and I wouldn’t recommend it’s internal use for children. If you grow it yourself, you can use the older larger leaves in small amounts for adults. It makes an absolutely wonderful poultice. My mother used it for all kinds of bumps and bruises as well as bee stings. That said, lots of people do eat it, I would just use caution if there are any liver issues. Thanks for the egg white tip, I will pass that one along! Thank you both for sharing your concerns and thoughts. We do need to use caution and do our own research. I feel safe with our family taking comfrey – but that doesn’t mean everyone does. You both brought to light good points. Thank you! And I found this article intriguing. I had never heard of using egg whites before! I find it very interesting that raw egg poultice on that feet would reduce fever. I use raw egg white directly on mild burns to draw the pain away and it is very effective and soothing. So it certainly draws to “heat”. I also allow my fevers to go a little higher than you suggest for infants before interfearing. If it is climbing fast through 103’s and is reaching for 104. If it slowly climbs or sits ad mid 103..I watch it, but to not interfear…the spiking action of a quick rise when it gets in the mid 103 range is what watch for. Of course, I am not a docter..just a momma, who has always treated my family naturally, and sharing what I do. Then I would cool or reduce it by rotating cold wet cloth compresses (with or without select herbs or peppermint essential oil) on the forhead, behind the knees and under the arm pits, bend of the arm and bottoms of the feet as the compress spots. It’s interesting that you bring this up. I watch fevers very carefully, but if the child is acting normal, I tend to let them rise a little higher, watching them carefully. I’ve found, nearly without fail, that just about the time I’m starting to get nervous and thinking of intervening, the fever goes down on its own. Of course, my children usually don’t get serious illnesses…it’s the odd virus now and then…and I like to allow the fever to do its work of eliminating the bugs. That being said, I have one child who is absolutely miserable with even a low grade fever, and I do tend to treat him sooner than I would the others. But like you said, I’m not a doctor, just a mommy of (soon-to-be) five, and this has been my observation. I’ve been using peppermint oil and loving it, but I’ll definitely put egg whites in my arsenal. Interesting. That sounds a bit like our home. The threshold is different for one daughter and my son. I have one daughter that has to hit 103.2 to 103.4 or she won’t fight off the infection for good-the illness will linger long after everyone else has recovered. Weird, huh? I use the same temp guidelines as in this comment. I do treat fevers a little differently though, I am the mother of 5 and grandmother to 3 almost 4 🙂 We have been treating things naturally for about 20 years now. Fever is our friend!! My children have only had a couple of serious illnesses but have mostly run fevers with colds or a virus. Once I realize that they have a fever, I pile on the blankets and give them lemon tea with some cayenne pepper. We put on a garlic goot salve on their chest and feet and then I let it burn. Usually only takes about 30 min. to break the fever, sometimes a little longer. Most of the time one time is all it takes but my youngest is a stubborn fever sufferer and it usually takes two or three times to burn whatever he has going on. He is autistic and their immune system is less effective. I rarely even take a temperature, because I have just developed the feel for it. Only one time did my oldest run a fever of 105 and so we put her in the tub and gave her homeopathic Belladonna under her tongue. Immediately brought it down and when it went up again, the blankets helped her body burn out the illness. Of course, we do not take antibiotics anymore and so our bodies have the ability to fight off things with just the natural remedies. It takes time to wean your body and your child’s body off having to have pharmaceuticals to recover from illness. For all those just starting out, stick it out, it is so worth it. Just my experience!! Shalom!! When dealing with an allergy to that extent, I would try another home remedy for fevers instead of egg whites. We use onions. Cut an onion in half and put the cut parts on the sole of each foot and cover with socks to hold them in place. For a child, an entire half would be too big so we cut a slice off and use that instead. Our pediatrician uses two pairs of wool socks – first sock one pair in cool water. Place them on the feet of the person with a fever and then cover the wet socks with a pair of dry wool socks. I find this a tad hard to believe, seeing as how raw onion causes chemical burns, especially on children. Having treated many clients for fever, I can attest to the fact that onion on the bottom of feet is not the way to go. Unless this is being posted by a troll who is trying to hurt someone. Garlic is a very effective natural remedy that you can use as a poultice for a variety of things, but it can cause irritations to the skin. When we use it, we lay a wet paper towel on the skin before the garlic. I’m sure you could do the same with an onion if you were afraid it would cause problems. My grandmother did this for me as a child and it worked well. Directly on my feet with no problems. I have used onions for years on my daughters who have all gone on to become mothers them selves. We used slices which literally “fried” as the fever reduced. No burns but a very savory bedroom smell. My 5 year old had a fever of 104 and was growing really lethargic. I tried the egg whites and within an hour of one treatment her fever had dropped to around 100 and she was back to her normal self. Thanks for the tip! Hurray! So glad it worked for you and she’s feeling better! Very excited to try this…not that I want to have anyone with a fever, of course! I know this is gnowfglins 🙂 but would liquid egg whites from a carton work for this purpose? They r not egg substitutes, just 100% liquid egg whites. Seems simpler to keep a carton on hand during an illness than to waste such precious, healthy pastured eggs on feet… Unless there is a magical compound that makes them more effective fresh out of the shell, that would weaken over time? Thanks. I have to be honest – I’m not sure. If the egg whites have not been heated, altered, dried, processed, etc. I’d say it would be worth a try when the time came. . .but my guess is that they do *something* to them – even if they are 100% egg whites and they wouldn’t be as effective. Sorry I can’t help you out more! Thank you for your honest reply. I believe they are pastuerized at low temps, so perhaps some enzyme may be killed off that would make a difference. But I suppose it would be worth a try, with fresh eggs at the ready as a backup. 🙂 They are just pretty expensive for us around here. Thankfully, by God’s grace, we stay so healthy that we rarely deal with very high fevers. 🙂 Thanks and blessings! I’ve successfully used ACV (apply directly to feet or soak/wring out socks with it) to lower fevers with my children. It sounds like the egg whites work in a similar way. Thanks for the info! Dehydrated fevers are the ones that cause damage: to bring a fever down, take a child-sized enema, dump out that saline stuff and replace it with just water. If you think it would be best to clear things out first, use COLD water to cause a BM (I just administer the enema to a child while s/he is sitting on the toilet, unless they are very young). Then insert WARM water, which will absorb almost immediately and go to the kidneys for filtering then on to the bloodstream within minutes (you can repeat a time or two if needed, especially if their stomach is not accepting fluids). Adding garlic (powder or crushed fresh) helps too, and you’ll smell it on their breath almost immediately. It’s LIFESAVING info. Keep a bulb syringe or enema bulb in your house. Especially if you live more than 10 minutes from emergency care. Sure, if your gut says it won’t help, visit the ER for high fevers first if you feel it’s best. Chances are, they’ll hook up an IV. Great info in this article–thank you GNOWFGLINS and Paula! Wendy, great remedy. I have given many cool to warm water enemas for fever reduction. Good idea to have a bulb syringe or enema bag in the home. That way when the need arrises you have what you need already in the home. Physician’s do not recomend giving Aspirin to children under the age of 18. It can cause Reyes Syndrom which can result in complete paralysis of the body. We had a case here in Michigan many years ago with a 4 year old. The Dr. was sued for prescribing it and the parents won the case. Aspirin is known as an EMPIRICAL DRUG. Define: All of its healing properties are unknown, all of it’s side effects are unknown. Pedi docs here in Michigan do not even want to give Tylenol to children as it creates severe liver problems. So they recomend NSAID (MOTRIN). None of these products are really good for the body, but in an emergency with a high fever of 101 or above liquid Motrin is the best. Remember you only cough when the cough reflex is stimulated (dripping sinuses). Drink plenty of water and like my grandma did, chew a piece of bread to collect all the excess mucous in the throat area and wash it down into the stomach for digestion. It is important to remember that during a bad cold DO NOT EACH DAIRY PRODUCTS (milk, cheese, butter, etc) as they increase the bodies secretion of mucous and make the cold worse. I hope this helps someone out there. The egg white theory is good as long as you are not allergic to EGGS………. Actually research has shown that milk and dairy products do not increase mucous, so that is a fallacy. I’ve used two drops of peppermint essential oil in a carrier oil like avocado on the bottom of my kids feet. Cover with socks and the fever lowers with out Tylenol. Love essential oils. I love natural fever reducers. I’ve also used the Peppermint Essential Oil (Young Living) with coconut oil on the bottom of my son’s feet and it brought the fever down in less than an hour. That’s great info to have thank you. I have done it with half an onion on the bottom of the feet and that also works well….. I was surprised to see that the bulk herb store lists boneset as an alternate name for comfrey. As far as I am aware, comfrey is the more standard common name for Symphytum officinale. Boneset, on the other hand, more commonly refers to plants in the genus Eupatorium, and specifically to the medicinal herb Eupatorium perfoliatum, though Wikipedia lists other uses as well. The use of multiple common names for comfrey is made more confusing because S. officinale and E. perfoliatum have many overlapping medicinal uses and (if I recall correctly) often appear together in herb mixes. Thanks for the interesting article. I totally agree with you and carefully watch the fever and I only intervene when need be using the homeopathic remedy Belladona. Perfectly safe and works very quickly. Since I’ve adopted homeopathy and healthy organic eatting my kids are hardly ever sick. One thing to keep in mind, if your child’s normal temp. is lower than what is considered normal, you need to adjust when to intervene and lower their temperature. I think it’s a good idea to check your child’s temp. when they are well so you know what their real normal temp. is. 1. Fever and inflammation in tissue is caused by positive charge. 2. Raw egg white contain negative electron donors. 3. The electrons neutralise the positive charge thereby bringing down the fever. So cut onions, potatoes-anything raw is actually electrically alive and would probably work.If you have an ionic footbath, setting it at 100% negative ions would work too. The Body Electric by Robert Becker is a great book about how all living beings are electrical beings with electromagnetic fields. Thanks! It makes so much sense.Wish I’d known when my kids were growing – but at least there’s grandkids. Interesting about egg whites. I may try that next fever. I do as Wendy above mentioned. Give an enema. I give enemas with a small rubber bulb syringe. Not emptying a Fleet one and refilling it. But, buy a rubber enema bulb syringe for the enemas. Enemas dont hurt and are a great remedy. I was told not to give (as Wendy stated) an enema when they are on the toilet. I give enemas when on a table or across my lap. Very much agree with Wendy about having a enema bulb in the house. I love learning about home remedies and nature healing. The egg white remedy is amazing. I have to try it on one of mine. Natural healing, home remedies and herbal remedies are wonderful. Never should be doubted or made fun of until, you know for sure they do not work. I will try various natural remedies as long as there is no harm and they do help. ENEMAS: Wendy great you mentioned enemas. One of the best home remedies to bring a fever down is an enema. Especially the garlic enema or the catnip tea enema. I have given home enemas for fevers and they do bring a fever down. Also cleanse too. They are great for constipation. You can find the catnip tea enema for fever in the book Prescription For Nutritional Healing. Instructions for preparing the tea, how to give and such is in the book. It says to give a catnip tea enema about every four hours until the fever is gone. Good that you give enemas Wendy. But I agree with Deb that best to give an enema across the lap, on bed, or on a table. IMHO standing over toilet is not the best way to give an enema. You are fighting gravity and uncomfortable to get an enema like that and possibly hard for the person giving the enema. Yes you can use the Fleet disposal enema by emptying the contents out and refilling with water. But I agree with Deb it is better to by a small rubber enema bulb syringe. I have the 6 oz Cara enema bulb. Always clean the enema bulb with warm soapy water after each use. Rinse well. Let it sit out for a few days to air dry. Don’t store it damp or wet. This will cause mildew. Wendy is right — repeat the enema if needed. Sometimes there will be no water coming back out. This is because the body absorbed the water. Possibly dehydrated. If no BM in a few minutes, give a second enema. Enemas are not difficult to give. They are a very good remedy. If old enough, tell why an enema is needed. The enema will help them and make them feel better. Nothing to be ashamed of or scared of. I also think every mom should have a enema bulb syringe in the home. Of course always best to check with doctor/ped before giving any home remedies. My mom and aunt gave enemas for fevers and constipation. I give enemas to my kids when needed for fevers or constipation. They work! A drug/chemical free easy natural home remedy for fevers and constipation. After reading about the egg remedy for fevers above, I will give that a try the next time one of mine has a fever. I wonder why and how the egg remedy works?? Any moms have questions about an enema? Please post your questions. We use homeopathic cell salts. #4 Ferrum Phos works wonders on fevers. Our daughter is 7 and we never used any other remedy to bring down a high fever. Feel about fevers? Try to let them run their course if no too high. Agree fever does serve a purpose. This is my own feelings. Do not take it as medical advice. Best to seek advice from a doctor or pedi before giving any home remedies. What do I do if the fever is too high? I have given catnip tea. Also given cool – tap water enemas. I have not given as Wendy (above) has. She says to give a Cold water enema first followed by a warm water enema. Interesting. Where did you learn that Wendy?? My mom gave cool water enemas for fevers. I have given mine many cool water enemas as well. Works great. If the fever isn’t brought down with the first enema, I give a second enema a few hours later. The fever is usually brought down then. Wendy ( above) gave enemas over the toilet. If sick in bed, I find it is easier to give the enemas when in the bed on a towel. Either on side or when on tummy. Most of the time across the lap is the best way to give enemas. Haven’t tried the egg white remedy yet. Will try that next fever. I love learning old home remedies. I will let you know how it works. OMG I never heard of egg whites for fevers. Next time one of mine has a fever I will try this remedy. Always good to learn new remedies. Not saying what to do or not do. You as the mom have to decide what remedy to give yours. I would advise for you to seek medical help before trying this or other remedies. Fever is usually seen as 100 F taken rectally. From what I have been told is not to treat a fever unless over 101. And to take to doctor if over 104 and has other symptoms as well. Have three kids. As soon as I see one of mine has a fever I note any signs and symptoms and take rectal temp which is more accurate. If under 104 and no other symptoms are presented I start by giving lots of fluids. Juices. If the fever did not go down then give a tap water to cool water baths or baths. Never give cold water baths. Some times I may wrap him in blanket or hold close to me to break the fever. Also use cool cloths on forehead, feet and legs. I continue with fluids, cloths and baths. Taking rectal temp about every four hours. If the fever goes higher I give cool water enemas every few hours. As long as not over 105 and no other symptoms signs are present. Enemas soothe and relax. More important an enema cools him and keeps him hydrated. Which is important with a fever. I give a cool water enema. Have him expel the enema. I encourage him to retain the enema for as long as possible. To cool and hydrate. If the temp hasn’t gone down or risen, Another enema is given a few hours later. For him to retain the enema better and administer a good amount of enema solution, I learned not to give enemas when laying on tummy. Best if on back or side. Some may disagree with how I handle fevers. Check with your pedi for advice. Some one above mentioned every mom should have a enema bulb or enema bag in the house. I agree. I hope never see another fever but the next time I will try the egg whites. I am going to try egg whites next time one of mine has a fever. Like other moms have mentioned, unless over 104 or so and no other symptoms, cool cloths, liquids to drink, cool baths and possibly enemas given. Love reading the fever natural fever reducers. Wendy, I have never heard to give a cold water enema then a warm water enema for fevers. You mentioned garlic in the enema. That is a very good fever reducer! A garlic enema. My neighbor is a LPN (nurse) and she told me to never give a cold water enema for a fever. She told me to give enemas either on the bed, across my lap, on a table (as she does for hers) or on bathroom floor. Not to give one when the patient is on the toilet. Recently one of mine had a fever. I also didn’t want to use “traditional” remedies. So, gave him a garlic enema. Read about this remedy in book Prescription For Nutritional Healing. Has directions in the book how to make the tea, how to give the enema and how often needed. It says to give the second enema if the fever does not go down four hours after the first enema. Of course, check with your provider/doctor before giving any home remedies. Or enemas. I want to add some clarification about the temperature guidelines in the article. To the best of my knowledge, a low-grade fever is not, in and of itself, any more dangerous for a young infant than for an older infant or toddler. However, any baby under about 3 months or so who’s running ANY fever at all (so 100.4+ — rectal, I think) needs to be seen by a doctor. This is because a fever in a new baby can be an indication of very serious illness (such as delayed Group B strep) that can very rapidly go septic. So don’t just bring the temperature down — see a doctor. But if the doctor has ruled out something more serious than, say, a simple virus, you may be able to just let the fever run its course. Paula great page here! Love learning more about natural home remedies. Thanks for all who shared with your comments. Wendy, who commented a while ago, you were first to mention the enema. It is a very good fever reducer. And cleanses harmful toxins out of their systems when sick with a fever! My friend Kay (who also commented above) has administered the enema a few times. She told me it works. I am going to buy the small rubber enema bulb syringe soon. They are only a few dollars. Next fever, not hoping there will be a next time, I most definitely will do the egg remedy. I a amazed that such can bring a fever down. I am very open to home natural remedies vs OTC meds and chemicals. Having four kids (two to 7 yo) I think going the natural way is the best to do for their health. I am sure the one getting the next home remedy (enema, egg or onion) in my home will take a little talking to before administering the next remedy or remedies. The only thing I disagree with is Wendy saying is to give the enema on the potty. Everything I read and was told, this is not the way to give one. Even in the old home nursing book I have says on lap, table or bed for it. It also says to get doctor’s ok to give one. And for the first time ever may be best to have another mom to assist and possibly teach it. Especially if the one getting it for the first time ever may resist it by fussing, fighting, squirming, kicking etc. The old nursing book I have says the second enema is always easier to give. I really want to try the egg method! OMG the one getting that remedy will think mom is nutty now. And talked too much with Kay, Wendy and read too much on here. Of course always,always, consult with your doctor or pediatrician before giving home remedies. My naturopathic doctor told me th enema is a very good home remedy for moms to give.